Since the weather forecast wasn't overly promising, and since I was still a bit sore from hiking Owl's Head, I decided to do a somewhat tame hike in the Ossipees. Arriving at the Shannon Brook Trail trailhead, there was only one other vehicle in the parking lot. After crossing the road, I was on my way up the ugly beginning of the trail (it passes by some junk). 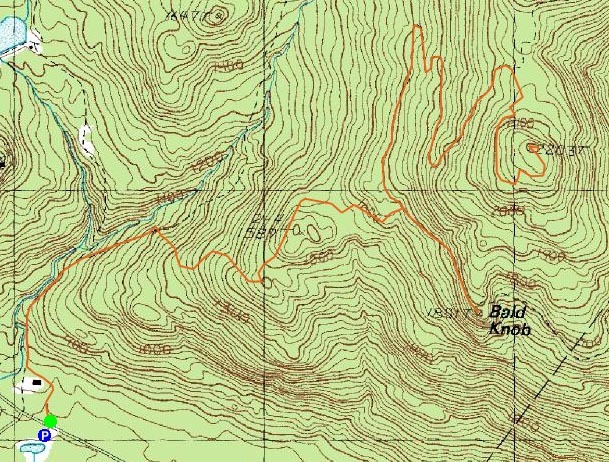 I almost missed the Bald Knob Cutoff Trail trailhead, as it is up the bank from the Shannon Brook Trail. 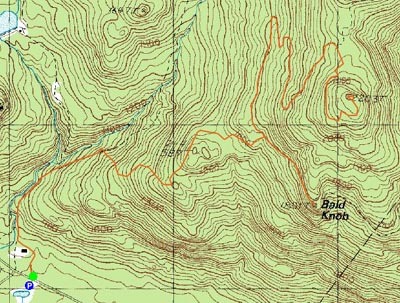 The Bald Knob Cutoff starts off somewhat steeply, before becoming more gradual as it arrives at a nice lake viewpoint. From there, it dips down a bit, before continuing a gradual ascent. 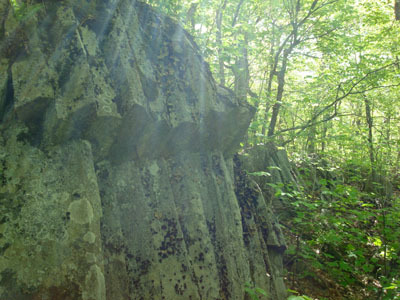 One point of interest was a rock formation, called columnar jointing. There was a very short spur path to this area. 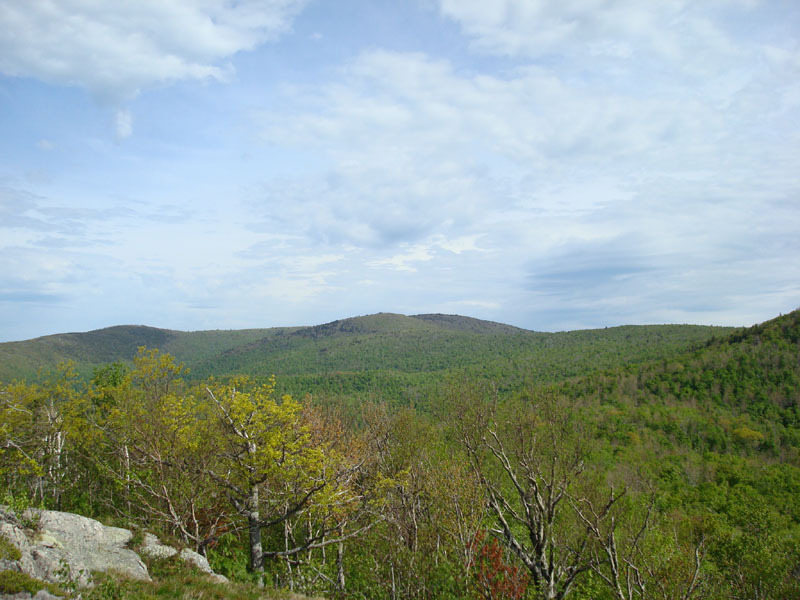 After passing the rock formation, the trail started to pick up in pitch again, before reaching the Bald Knob Trail. 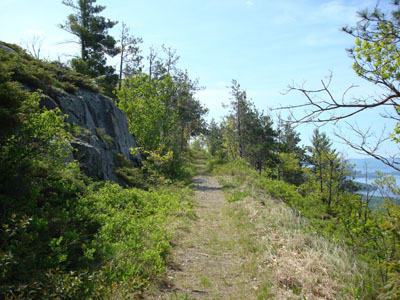 An old carriage road, the Bald Knob Trail descends gradually to the Turtleback Mountain Trail. On my way to that junction, I heard what sounded like a large animal heading away in the woods. Though I couldn't see what it was through the leaves, I suspect the fresh moose prints were a hint. 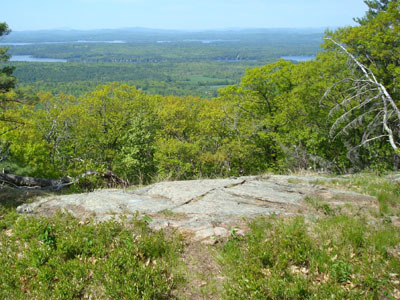 The Turtleback Mountain Trail is also an old carriage road. Like the Bald Knob Trail, it's in decent shape and is gradual. After a series of switchbacks, the trail meets the Turtleback Summit Trail, also an old carriage road. Unlike the others, this one resembles more of a path, as it was only recently reclaimed and doesn't appear to receive any wheeled traffic. 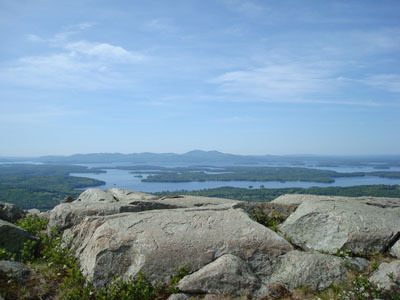 The views from the summit were excellent - Mt. 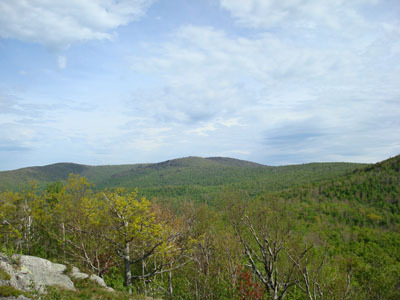 Roberts, Faraway Mountain, Mount Shaw, and the fake Black Snout were all easily seen, as well as some points to the southeast. 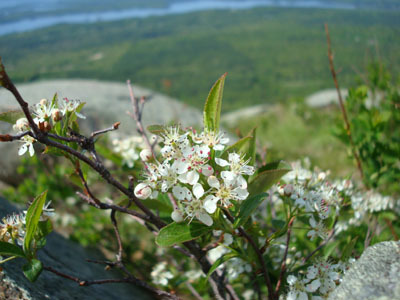 Some chainsaw work could also review some nice lake views, but there are adequate ones available nearby at Bald Knob. 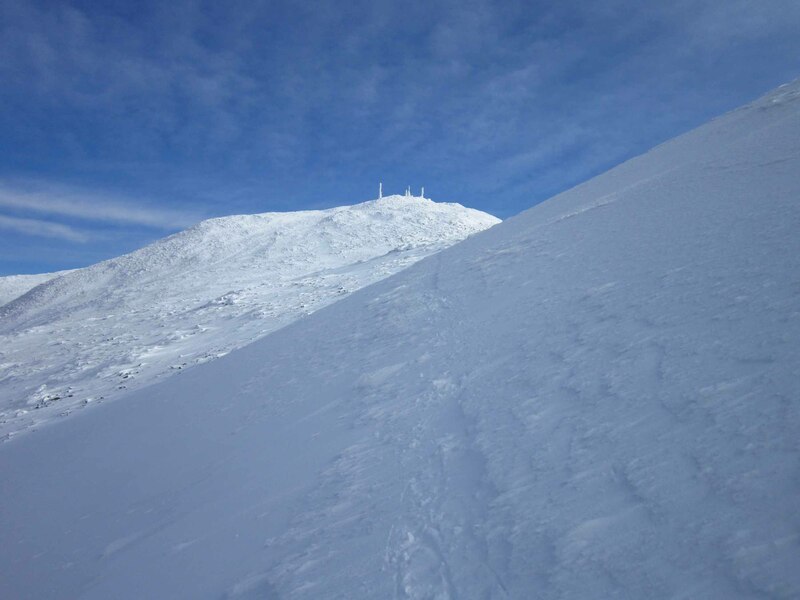 The rocky summit also features the remnants of a removed observation tower. While I was thinking about calling it quits, I really had a hankering for a lake view, as it was feeling like a nice summer day. Thus, I continued past the Bald Knob Cutoff to Bald Knob. What a treat! The last section of the Bald Knob Trail before the summit is beautiful - it's somewhat cut out of the side of the hill and features nice lake views. As usual, the views from Bald Knob were great. If I didn't have to contend with the bugs, I would have stayed there for a long time. Nonetheless, there wasn't enough of a breeze to keep the bugs away, so I eventually headed back. Not a bad hike at all! Directions to trailhead: Take Route 109 South from Route 25. Bear left onto Route 171. 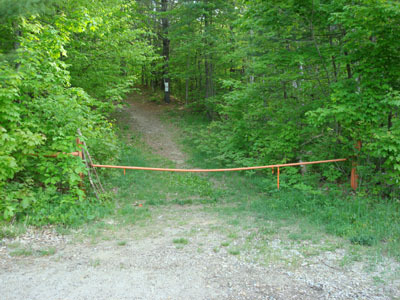 Shortly after the main Castle in the Clouds entrance, there will be a hiker parking lot on the right side of the road. Trailhead is directly across from it.